ancient commons, both beautiful and refreshing stretches of wild countryside. habitat for wild flowers, birds and animals and the life of ponds and stream. many rural areas of eastern Europe. to Westminster Abbey, some time probably before the Norman Conquest. they could cut, with prosecutions and fines for breach of these rules. elsewhere in the village instead of using the Common. obviously been enclosed some time before. died ultimately in 1827 aged fifty-four. in 1861 conveyed it back to Richard Garth, the Lord of the Manor, for £100. 1874 Garth was in a position to legalise the extinction of all his copyholds. compensation if his garden were sold and used for building purposes. to take clay for bricks and tiles for building Morden Park House. this road led from the London to Epsom-road. It is now Garth-road. who were still in business there in 1918.
them, made a weathervane in the form of a peacock for Peacock Farm. on 8th March 1974. Miss E M Jowett , Vice President of the Society, died in August 1990. 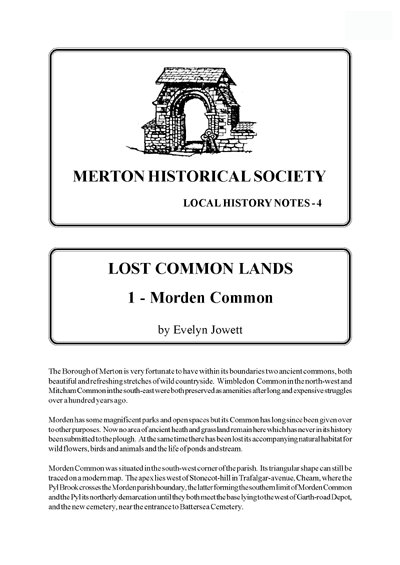 This entry was posted in Publications, Local History Notes and tagged in lhn, morden.